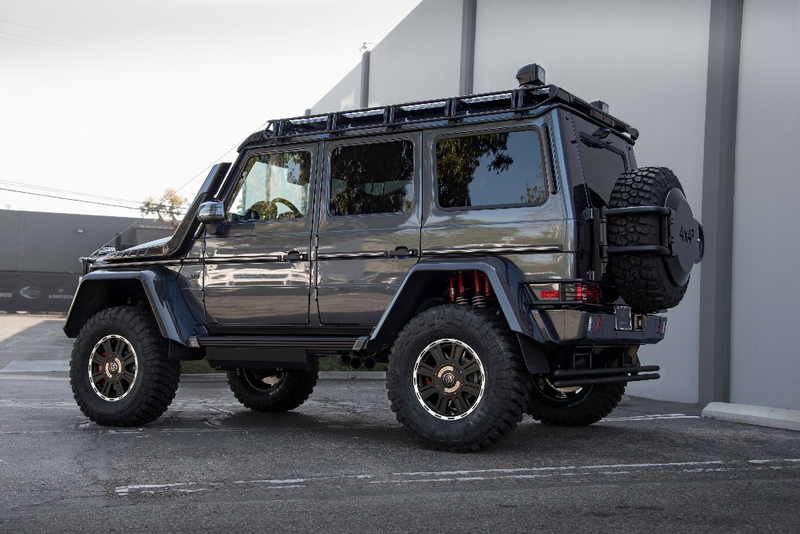 BRABUS 550 ADVENTURE 4x4²: That is the label of an exclusive and superlative extreme off-roader from the world’s largest independent automotive refinement specialist. 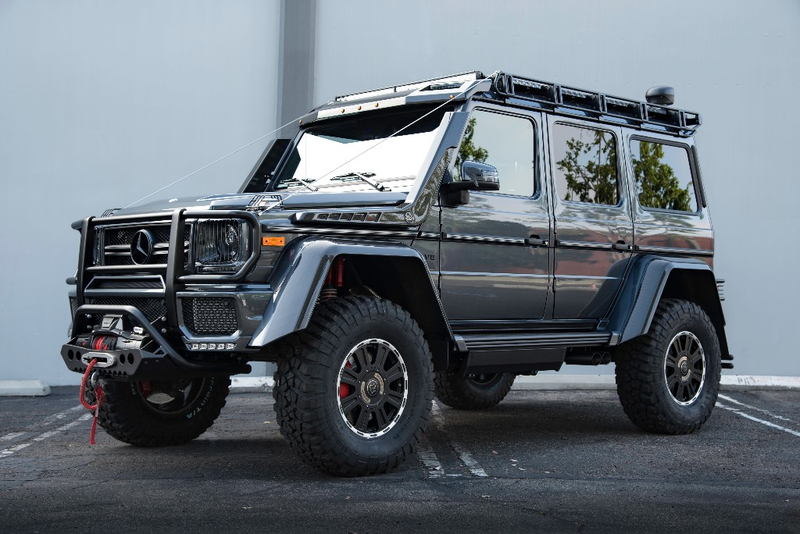 Based on the Mercedes G550 4x4², the engineers and designers of BRABUS developed a cross-country vehicle with an output of 550 hp that not only looks great on the world’s magnificent boulevards, but is also superbly suited for automotive adventures far off paved roads and thereby does credit to its “ADVENTURE” designation. Immediately striking at the front is the combination of front bumper guard, underride guard and winch. In addition, all chrome parts of the platform car were painted matte black. Robust wire mesh protects the black-tinted BRABUS xenon headlights and the turn indicators on the fenders. In concert with the daytime running lights, which are mounted using special front bumper attachments, the newly designed lamps replace the production lighting components at the front. Brush guards running from the grille guards to the roof rack are also part of the heavy-duty off-road concept of this supercar, as is the additional lighting unit on the black roof rack of the BRABUS 550 ADVENTURE 4x4². 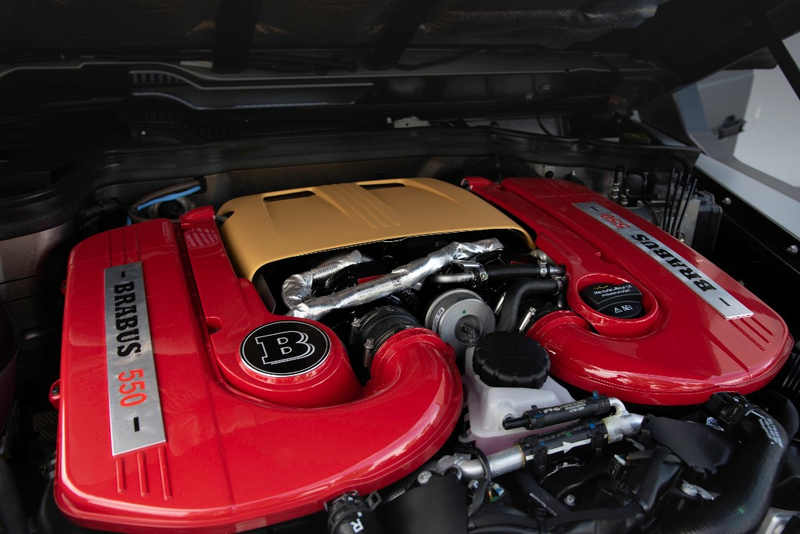 To increase the off-roader’s fording depth, the BRABUS designers developed a new air intake for the V8 engine. The two-piece system is made from naked carbon with a matte protective finish – the intake snorkels rise up along the two A-pillars. Due to the high entry, BRABUS offers special power-retractable steps that make climbing in and getting out of the cross-country vehicle easier and safer. The BRABUS bodywork conversion also includes a striking rear bumper with integrated fog and backup lamps as well as a central deflector. Carbon covers with a matte finish for the door mirrors round off the martial appearance of the extreme off-roader. At the rear, the two corners of the roof are fitted with power-adjustable LED searchlights, which can be rotated and panned by remote control. The taillights are likewise protected by robust wire mesh. To give the BRABUS 550 ADVENTURE 4x4 more off-road prowess, BRABUS custom developed the electronically adjustable BRABUS special suspension, which is controlled by the driver with the BRABUS Touch Control Panel in the cockpit. It uses height-adjustable struts made from high-strength aluminum, which reduce unsprung masses and optimize heat dissipation. The design features an expansion chamber at each strut, resulting in a 15 percent higher damper fluid volume and thereby tremendous reserves even under maximum loads. The BRABUS engineers developed the BRABUS Monoblock HD alloys specifically for driving in rough terrain. They withstand even the most extreme loads. Selective structural details such as the indentations in the outer flange and the spokes mean the eight-spoke wheels are designed for maximum strength. The new wheels of size 8.5Jx18 are painted ‘Gunmetal Black’ and feature a partially polished outer edge. By being manufactured using state-of-theart forging technology, these hi-tech wheels are not only extremely robust, they are also light compared with a conventional wheel capable of bearing these loads. As a result, each complete wheel with tire represents weight savings of 33 lbs over the stock wheel. The BRABUS Monoblock HD wheel has numerous special design features: The extended hump design gives the wheel significantly enhanced run-flat properties should a tire be damaged. A second inboard valve makes the wheel ready for a tire pressure control system that allows increasing or decreasing the tire pressure on the fly without having to stop at a filling station. The twin-turbo four-liter eight-cylinder engine of the Mercedes G550 4x4² is rated at 422 hp ex-factory and is thus an excellent basis for the new BRABUS B40-550 PowerXtra performance upgrade. Two high-performance turbochargers with larger compressor unit and a special core assembly with reinforced axial bearings produce a higher boost pressure. Also included is the matching plug-and-play BRABUS PowerXtra auxiliary control unit, which is adapted to the electronic engine control unit and provides modified boost pressure control and optimized mapping for injection and ignition. Equipped with BRABUS B40-550 PowerXtra engine tuning, the rated power output totals at 550 hp at 5,600 rpm and the powerful peak torque of 590 lb-ft, on tap constantly between 2,250 and 4,750 rpm. Of course, like all other BRABUS components, this performance upgrade is backed by the three-year, 62,000-mile BRABUS Tuning Warranty. Sound, performance and longevity are the outstanding traits of the BRABUS stainless sport exhaust system with actively controlled exhaust flaps. It allows drivers to choose between a subtle ‘Coming Home’ mode and a decidedly powerful engine sound in the corresponding ‘Sport’ position at the touch of a button in the cockpit. The BRABUS exhaust system also adds some thrilling visual highlights with two black chromed tailpipes in an unusual side pipe design on the driver’s side. For information please call or email us!